The year is 1703. Czar Peter the Great is working to make the newly founded Saint Petersburg a city on par with the greatest cultural hubs of Europe. Workers are needed to gather resources, construct buildings, and develop infrastructure. Gaining the support of the aristocrats will facilitate the completion of city projects and help to give the city a more unified direction. Improving existing facilities and training leaders and more efficient workers is the key to becoming equals with Europe's finest cities. The task is not an easy one; money is scarce, and the people in charge of implementing Czar Peter's plan are rivals who are vying for workers, building rights, influence over the aristocrats, and materials for upgrading buildings and training leaders. The question of who will come out on top is decided by how you and your opponent(s) play Saint Petersburg. Saint Petersburg is a card-driven board game for 2-4 people that puts you in control of the development of Saint Petersburg. Players take turns collecting the personnel, buildings, and upgrades that will lead them to victory. 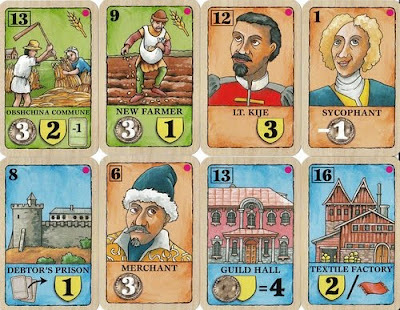 Every card is brought into play for a price, and the cards have different effects--in general, worker cards bring in money, building cards give points, aristocrat cards provide money and sometimes points as well, and upgrade cards can replace workers, buildings, and aristocrats and grant the owner special abilities, such as reducing the cost to put new cards into play. The player with the most points at the end of the game is the winner, but careful investment and sound money management is essential to being able to afford the point-giving cards in the first place. It's a balancing act between gathering money and generating points, and your opponents can compound the matter by grabbing cards you need before it's your turn to pick them up. 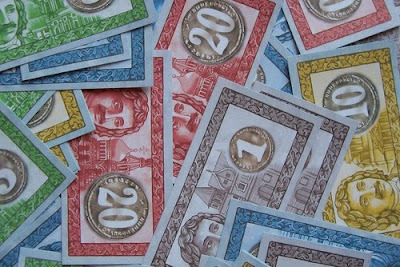 The limited money supply plays an important role as well: even when you do have all the cards you want, it's commonplace to discover that you don't have enough money to put them all into play, and players are penalized for having extra cards in their hands at the end of the game. The odds may be against you, but they're also against your opponent(s); it's just as much to your advantage to go after cards that will help you as it is to take away cards to foil your opponent's plans. Even if that isn't true, it's always fun to see your best friend wriggle uncomfortably as you snag the one card he needed to turn his game around... especially when you don't need it and can't afford it. A typical game of Saint Petersburg typically runs around 45-60 minutes... once you know what you're doing. Saint Petersburg is German in origin, and the English translation of the instructions is grammatically acceptable but often makes about as much sense as Shakespeare after a few rounds of mead and a blow to the head. I exaggerate, of course, but the game is complex enough that you'll probably spend more time familiarizing yourself with the rules than a casual gamer would be comfortable with, so I suggest playing your first game of Saint Petersburg with someone who knows the rules or someone who is patient enough to work everything out with you. If that's not possible, just supply your fellow first-time players with enough mead and blows to the head to keep them at bay until you've figured out the rules. 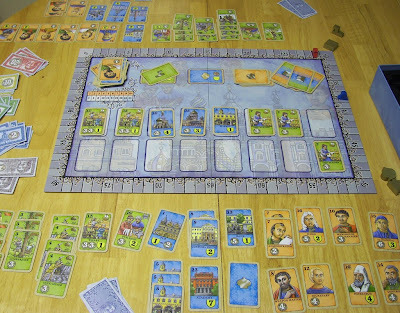 Saint Petersburg has a high level of replayability thanks to the variety of cards, the relative diversity of possible victory strategies, and the difference in game dynamics depending on how many players are involved, but there are expansion packs that add some new cards to the mix, replace existing cards to switch things up a bit, and add the option of having a maximum of five players instead of four. If you're in the market for a city-building game with an element of competition that favors good planning over good luck, Saint Petersburg just might be for you. Sounds like a game that you need to build yourself up to.